The tree trimming service that we supply to our customers is an unbeatable mix of highflying tree pruning if that is necessary to the simpler trimming of shrubs or bushes around your property. The shrub and bush work that we do is reserved for our most creative; steady handed, and artistically inclined employees. We do everything from residential homes to country clubs. We need all the information we can possibly grab from our customers when it has to do with custom shrub cutting. Just try our amazing artists there is rarely a scene or situation that you can describe that one of our employees cannot recreate with shears and vision. Maybe you feel like your new home deserves a luxurious and elegant feel for your backdoor/ pool area. Call us at League City Tree Trimmers! 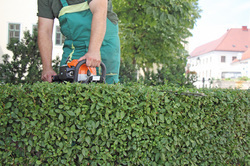 One of our crews that specialize in trimming hedges and hedge decoration will come out to you to find out the exact specifications for what it is, exactly, that made you want to call us and give us your challenge. The word challenge is important in regards to our Shrub Pruning. We find that no matter what crazy or creative idea our customers throw out there, we should be able to get the job done! And get it done right! Not only do we offer the artistic and custom hedging but we also do classic shrub pruning and trimming .You can call us if you would like a regular maintenance visit or if you would like to schedule us for a seasonal trim or monthly those are also options that we can explore. Once again the customer is setting the parameters for what we as specialists do for your lawn and garden. We need to make sure that the customer is explicit in their wants and needs so we can do the best job possible as quickly as is humanly possible. Along with these aforementioned services our crews also provide removal of any shrubs or uprooted bushes that need to remove from your property. Whenever your thinking of totally overhauling that yard or driveway just give us a ring and we can help with the whole job or just the clean up depending on the wants and needs of the customer. Usually our clients may decide that they are going to be envisioning redoing the lawn and shrubbery that they had previously, so that means a lot of bushes and shrubs for us at the League City Tree Trimmer to remove. Bushes and shrubs can be quite a rough job to remove on your own. The many deep roots and light branches of shrubs and bushes make it hard for a homeowner with a limited schedule to go grab his gloves and take them out him or herself. Don’t throw your back out working when you don’t have to! Just try to remember that we are on call M-Sat 7:30-5:00 for any and all of your shrub trimming or shrub removal needs.